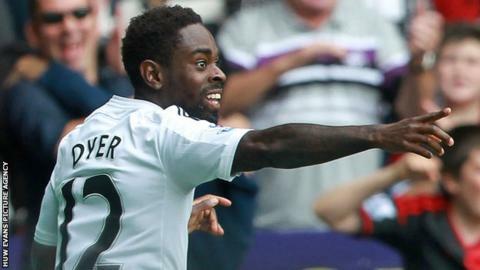 Swansea winger Nathan Dyer has not spoken to Roy Hodgson but is flattered by calls for him to be in the England team. Dyer, 26, has been shortlisted for the Premier League player of the month award after scoring three goals in Swansea's 100% start to the campaign. But Dyer, Wayne Routledge and Jonjo Shelvey were not selected by England boss Hodgson for recent games. "I'm concentrating on Swansea at the moment," Dyer said. "Everyone growing up playing football would love to play for their country and I'm no different. "There's not just me - there's Wayne and Jonjo that qualify and I think Jonjo's played [for England] before. "But for me it's just keep playing club football and keep performing and working hard and whatever happens, happens. "There's only so much you can do as a player. I'm just working hard and I'm enjoying my football at the moment." Swans manager Garry Monk claimed Hodgson should take a look at Swansea's English players after the club's unbeaten start to the season. Wales left-back Neil Taylor believes his Swansea team-mates have been overlooked by England because they are based in south Wales. Hodgson gave encouragement to Dyer and his Swansea team-mates that they remain in contention for a call-up. "I know the player Nathan Dyer very well, in the wide areas he faces a lot of competition but we know he's there as well," Hodgson said. Dyer's early season form in which he has scored three league goals has been recognised with a place on the Premier League's player of the month award shortlist. He and team-mate Gylfi Sigurdsson along with Chelsea duo Diego Costa and Cesc Fabregas and Aston Villa's Andreas Weimann are in the running for August's award. "It's brilliant. I can't take away the feeling that gives you," Dyer said of being nominated. "But it wasn't just me doing the work in the games. A lot of players, the likes of Gylfi and Wayne, are playing really well as well." Swansea will put their 100% record on the line on Saturday when they face league leaders Chelsea at Stamford Bridge.